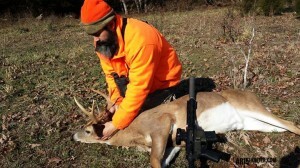 The Author’s Buck Taken “Quietly” with a Suppressed SBR Rifle. It has been a number of years since I was able to go back to my home state of Arkansas to hunt on the family farm. I’ve hunted there off and on for all my life and several times have had the chance to take a deer but couldn’t, for whatever reason, make it happen. It seemed they just always eluded me. So this year I told the family we were going to the farm for Thanksgiving with my folks and I was going to get serious about getting my first deer on our property there. Picking the gun to take was easy. There’s lots of up and down walking and a lightweight, compact, fast handling rifle is desired. It just so happened my TNARMS CO SBR fit the package perfectly. 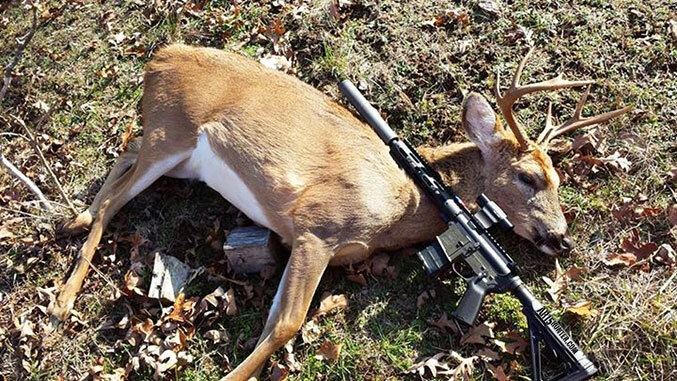 Also of note is the deer in Arkansas are not nearly as big as up here in Nebraska, so I decided that a .223 would be perfect for harvesting an animal. The first day my dad and me hunted, I used my bow in the morning. After we were done watching does walk around our stands, he suggested we go walk another area and see if the deer were up and moving. The weather was very warm for that time of year. Shortly after walking off and telling me where he was going I got a text that there were deer running my way. After about two minutes of watching, a pair of nice bucks bounded out of the woods about 250 yards away from me. They came into the clearing where I was standing, and I will admit that the first one was cleanly missed as he ran by me at about 100 yards. After he passed I took aim at the second one. The 50 grain ballistic tip found its mark on the first shot (I was leading them too much which is something I’m learning over the years) as he ran across the clearing in front of me about 100 yards away. It blew his heart in half and he ran about 10 feet, then fell over dead. The Author with his Arkansas Buck Taken “Quietly” with a Suppressed SBR Rifle. The ability to quickly aim the rifle was partly because of its light weight and good balance with the Quicksand suppressor on the end. The Quicksand suppressors are made by my friends at Gem-Tech. But, it was also due to a good optic and lots of practice. However, having that suppressor on the end of a 11.5″ barreled gun also made it VERY quiet. 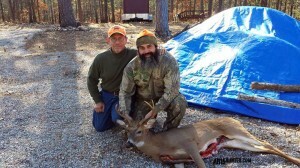 The Author and His Father After the Successful Deer Hunt. This “stealth” if you will, is what I believe made the shot at the second buck possible. As some of you know, an SBR is exceedingly loud. With a suppressor you eliminate much of that noise. Many states now allow hunting with “cans”, and there are tons of options out there if you choose to use one, as I do, much of the hunting season. Lastly, if you decide you want to try one, check your local laws first. I promise you, once you have tried hunting quietly with a suppressed SBR, or other firearm, you may never go back to the other way.